(The Telegraph) A religious reliquary containing blood from the late Pope John Paul II has been stolen from a remote mountain church in Italy, with speculation that a Satanic group could be behind the theft. A team of around 50 Carabinieri police officers with sniffer dogs were on Monday searching for any trace of the reliquary, which was stolen from the Church of St Peter of Ienca in the Abruzzo mountains at the weekend. The ornate gold object contains a fragment of material, stained with blood, which was purportedly taken from the clothing worn by John Paul II after he was shot during the failed attempt on his life in St Peter’s Square in 1981. It was donated to the church in May 2011 by Stanislaw Dzuwisz, a Polish cardinal and the Pope’s former personal secretary. The reliquary is one of just a handful in the world that contains the blood of the Polish pope, who died in 2005 and was succeeded by Benedict XVI. It was stolen along with a cross from the church, which lies close to Gran Sasso, a 9,550ft- high mountain in the Apennines east of Rome. The theft was discovered on Saturday by a priest from the religious sanctuary, which is dedicated to the memory of John Paul II. The Pope was very fond of the region and used to spend holidays there, walking, meditating and skiing at the nearby resort of Campo Imperatore. It is also famous as the place where Benito Mussolini was interned after Italy swapped sides during the war, and from where he was rescued by a team of German paratroopers in Sept 1943 during a daring airborne raid. “It’s possible that there could be Satanic sects behind the theft of the reliquary,” said Giovanni Panunzio, the national coordinator of an anti-occult group called Osservatorio Antiplagio. 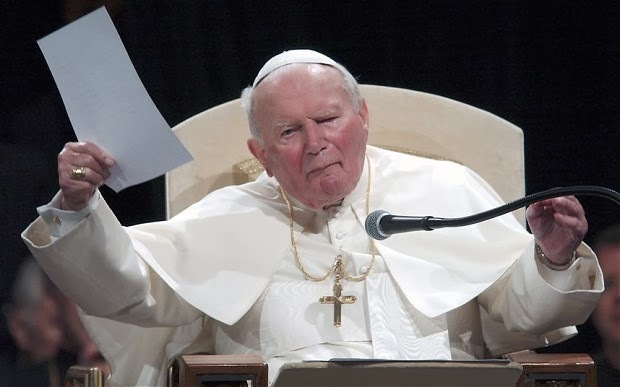 The theft of the reliquary comes as the Vatican prepares to canonise John Paul II, along with another former Pope, John XXIII, at a ceremony on April 27. At John Paul II’s funeral in 2005, crowds of mourners cried "Santo Subito!" - "Sainthood now" - prompting the Vatican to speed up the Polish pontiff’s path to canonisation. In Aug 2012, another relic containing a vial of the late Pope’s blood was stolen from a Catholic priest while he was travelling on a train north of Rome. The relic was in his backpack, which was swiped by thieves but later recovered in a thicket of cane grass by police.